Class 67 diesel locomotives Nos.67016 and 67017 worked the 07:55 from London Euston with a train of stock in a variety of liveries. 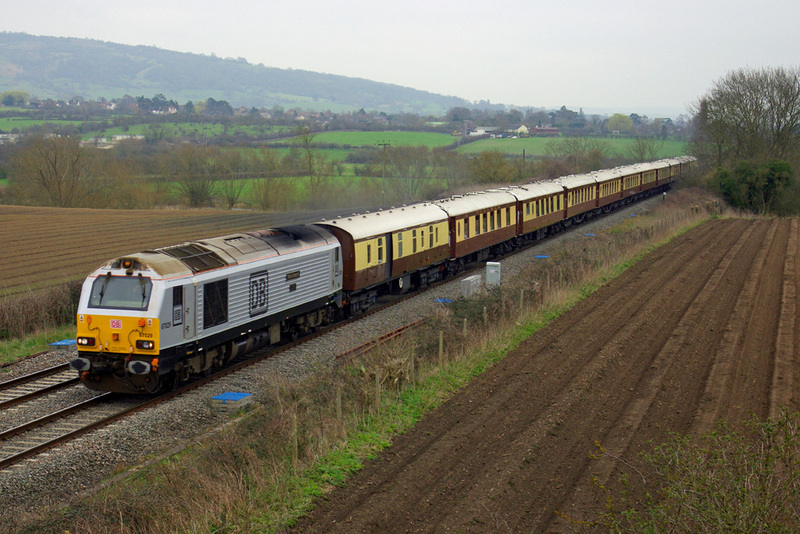 This train ran on Tuesday and Wednesday 13th/14th Match 2012 as well as on Gold Cup day on Friday 16th March 2012. This train was serviced at Worcester. Gold Cup day also produced two more special workings. 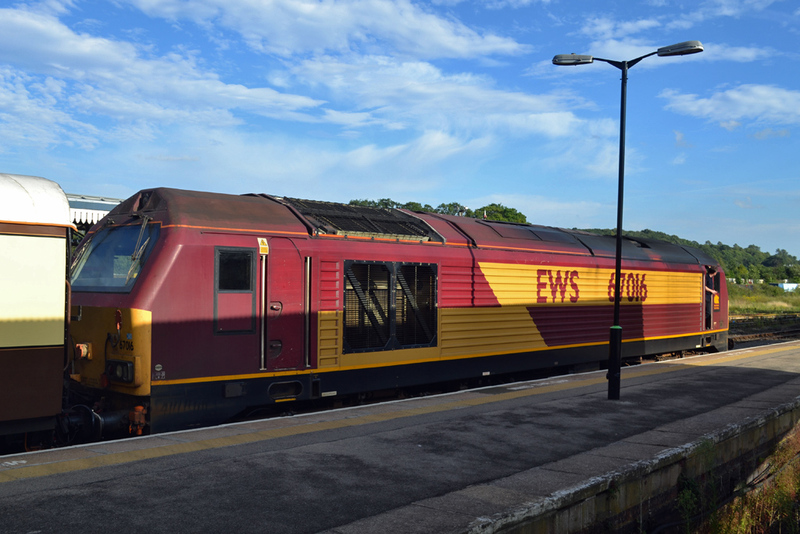 Class 67 diesel locomotive No.67029 worked from London Victoria to Cheltenham with the VSOE stock. 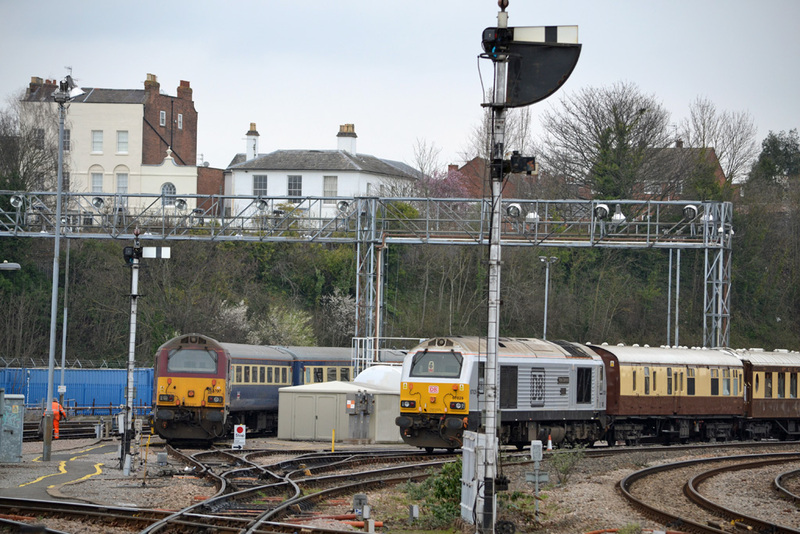 Class 47 diesel locomotives Nos.47790 and 47832 worked the Northern Belle train set from Liverpool Lime Street to Cheltenham (train code No.1Z71) returning as 1Z72. The empty stock from the Victoria train was stabled at Worcester whilst the Liverpool set went to Gloucester. The three specials were photographed by Pete Wilcox as they passed through Defford on Gold Cup day. Andrew Smith took the photograph of the stock stabled at Worcester. 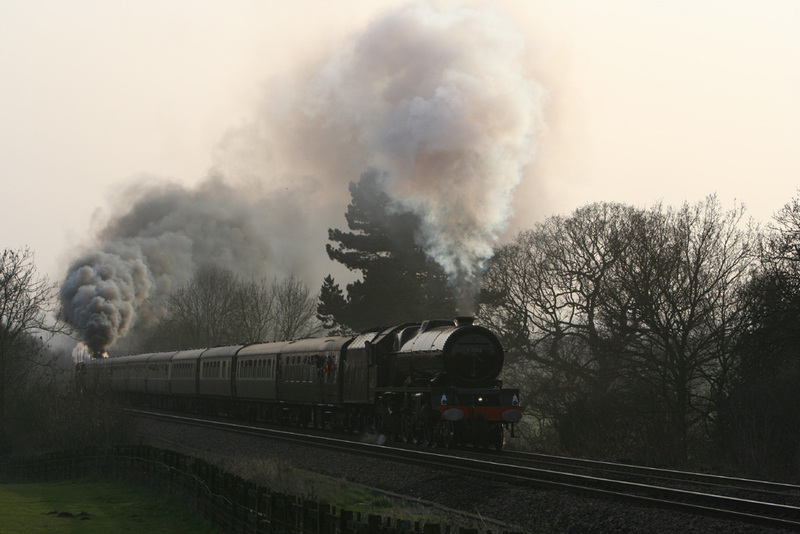 Robin Goundry took this magnificent photograph which shows ex-LMSR 'Princess Royal' class 4-6-2 steam locomotive No.6201 'Princess Elizabeth' climbing the Lickey Incline on Saturday 24th March 2012 with train code No.1Z65 from Bristol Temple Meads to Dorridge. Banking assistance was provided by a pair of ex-GWR 0-6-0 pannier tank locomotives Nos.7752 (painted in London Transport livery as No.L94) and No.9600 which are seen descending the Lickey Incline. Photograph taken by Robin Goundry. 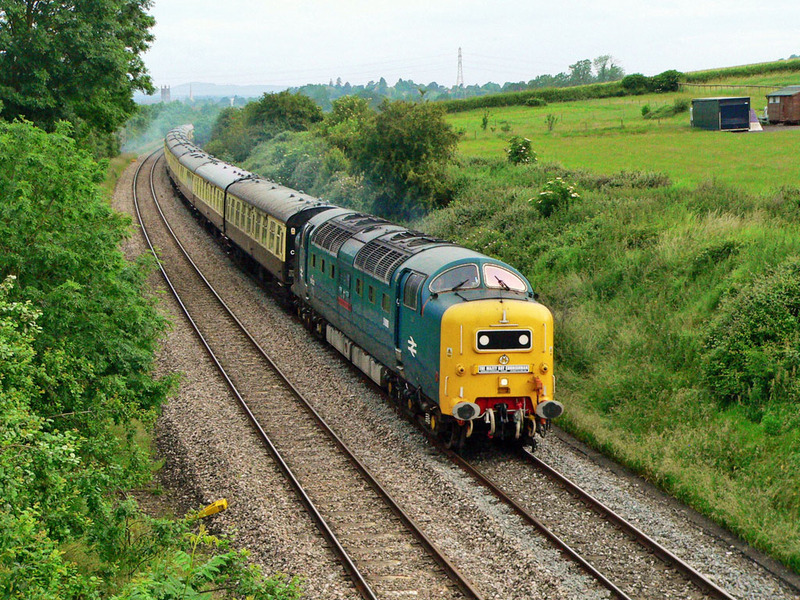 Saturday 23rd June 2012 was a day for insomniacs as two special trains passed through Worcester on their way to Penzance for the annual Mazey Day celebrations. Below: Class 55 'Deltic' class diesel locomotives No.55022 'Royal Scots Grey' passing Norton at 06:42 with Pathfinder's 'Mazey Day Cornishman' in very resting conditions for photography. 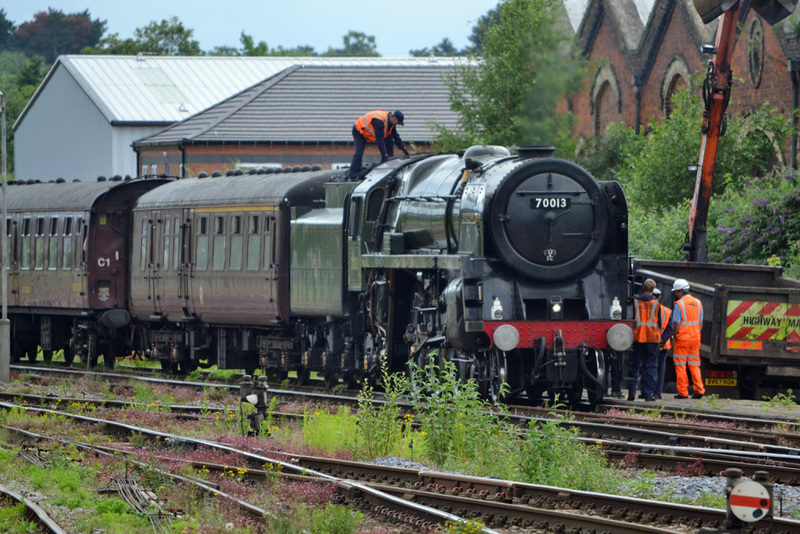 Saturday 7th July 2012 provided a rare opportunity to see both steam and diesel hauled special trains at Worcester. 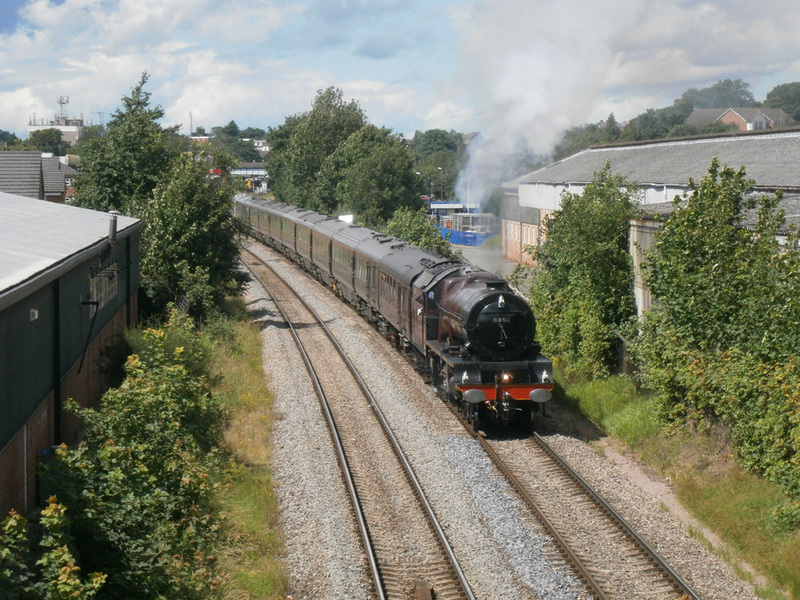 Above: Ex-BR Standard class 4-6-2 steam locomotive No.70013 'Oliver Cromwell with Northern Belle stock from London Euston takes coal and water in the siding to the south of Shrub Hill Station. 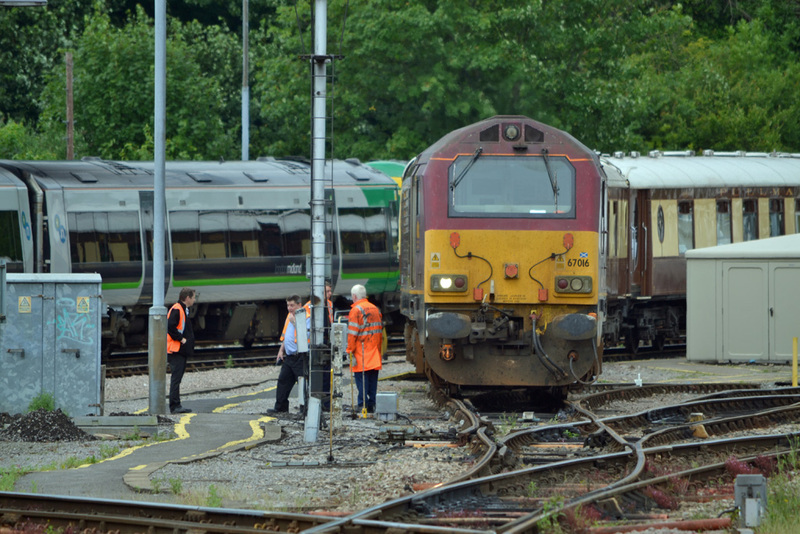 Below: DB Schenker owned class 67 diesel locomotive No.67016 visited with the VSOE train from London Victoria and is seen on Worcester Depot after running round its train. On Wednesday 11th July 2012 Queen Elizabeth II made her fifth royal visit to Worcester (the others were in 1957, 1980, 1989 and 2001) and Robert Pritchard was at Worcester to witness the event. At 13.36 at Shrub Hill the signals were set for the Droitwich line and in rolled class 67 diesel locomotive No.67006 'Royal Sovereign' piloting ex-LMSR 4-6-2 'Princess Royal' class steam locomotive No.6201 'Princess Elizabeth' at the head of ten coaches (support plus nine Royal) with No.67026 'Diamond Jubilee' at the back. The Queen had earlier visited Hereford (continuing to Worcester by helicopter) but as the train was out of gauge for Malvern Tunnel the empty stock travelled through Shrewsbury and Bescot. 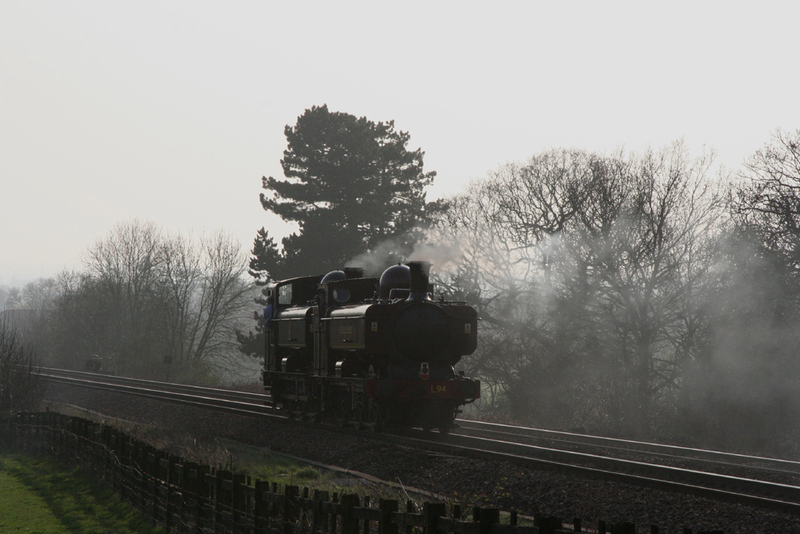 The train paused in the Platform Two for a few minutes and then continued beyond the signalbox so the steam locomotive could reach Midland Yard. Robert photographed the train from the Perrywood bridge with No.6201 was on the front and No.67026 on the back, the other class 67 having presumably gone ahead. Brian Ovington notes that a photograph he has seen shows the Royal Train returning to Windsor via the Stroud Valley line. 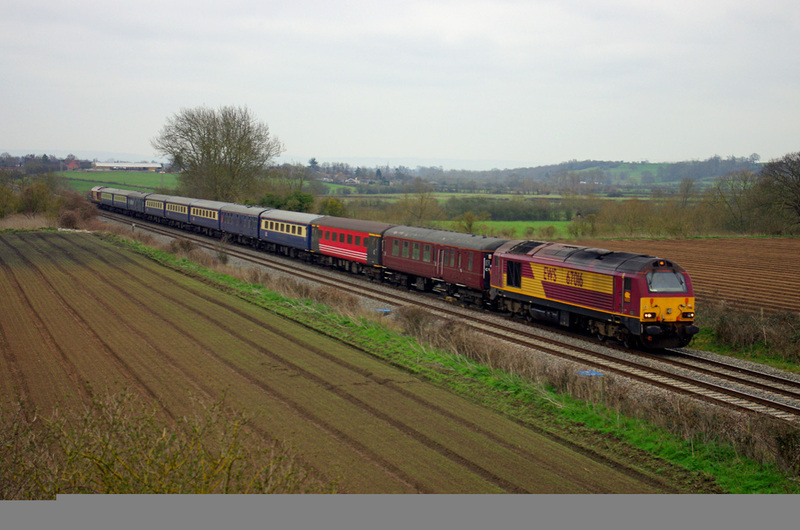 Peter Tandy advises that the train went on to MoD Kineton for an overnight stay. When No.6201 was built at Crewe in 1933 and proudly named after King George Vs granddaughter, the intended succession to the throne lay via Prince Edward (later King Edward VIII), but how differently events developed with both the lady and her namesake locomotive still hard at work nearly eighty years later. 46201 was bought directly from BR and had not even been repainted when it hauled two other preserved locomotives from Ashchurch to Bristol Bath Road depot open day in 1968. 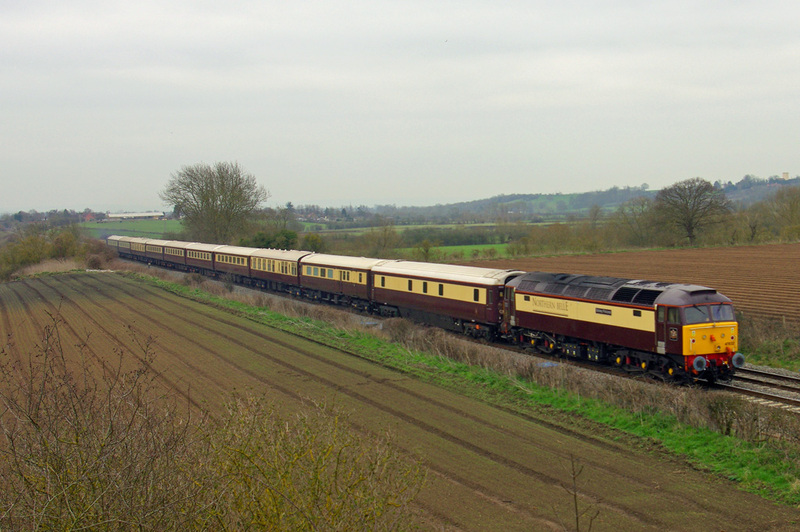 The official first day of autumn saw several charter trains pass through the county and Robert and Cooke and Andrew Smith were there to record their passing. First up at 10:14 with train code 1Z21 were West Coast Railways class 47 diesel locomotives Nos.47786 and 47854 on 'The Statesman' from Sheffield to Dartmouth. 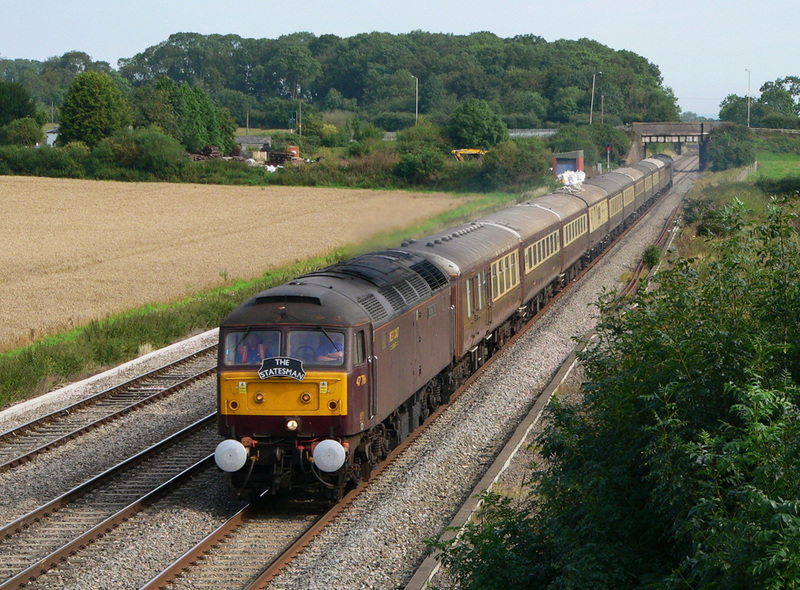 Robert Cooke photographed the train passing Spetchley. Later saw yet another visit to Worcester by DB Schenker's EWS livery class 67 diesel locomotive No.67016 and a train of VSOE Pullman cars. In rare late afternoon sunshine Andrew Smith photographed it at Worcester Shrub Hill with the 17:35 return working to London Victoria. On Saturday 3rd November 2012 Robert Pritchard was Worcester Shrub Hill as a pair of 0-6-0 pannier tank locomotives reversed their seven coach special train into the Hereford Sidings, i.e. the High Speed Train stabling point behind the far wall. The photograph was taken at 16.58, twenty-three minutes after sunset and required an exposure of 1/8 sec. @ f/3.3 (= full aperture at virtually full optical zoom) on ISO 400 despite 1 1/3 stops of deliberate underexposure. Ex-BR No.7752, painted as L92 of the London Transport fleet and Black livery No.9600 were the train engines. 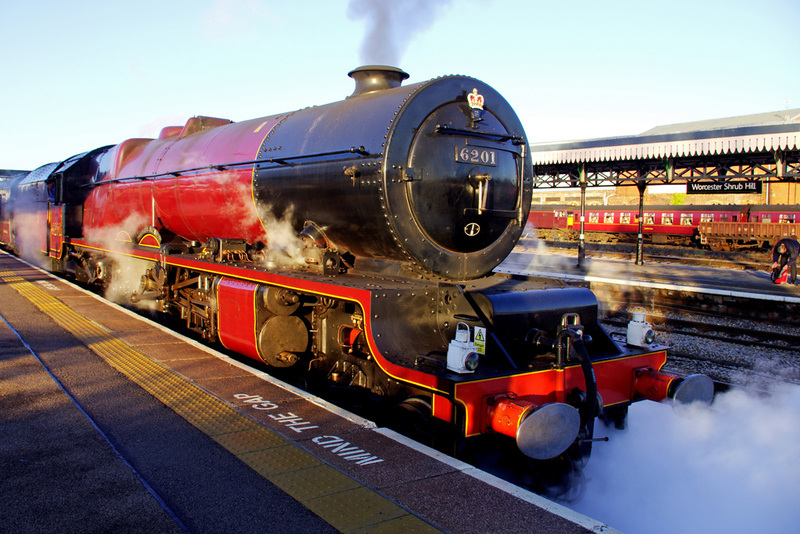 A four-day Christmas Victorian Fayre festival at Worcester not only caused traffic chaos, including on the road to Grimley (where there was a large coach park) but also brought the unusual sight of a special working from London Paddington to Worcester. The train was worked by ex-LMSR 4-6-2 steam locomotive No.6201 at one end with Class 47 diesel locomotive No.47500 at the other end. 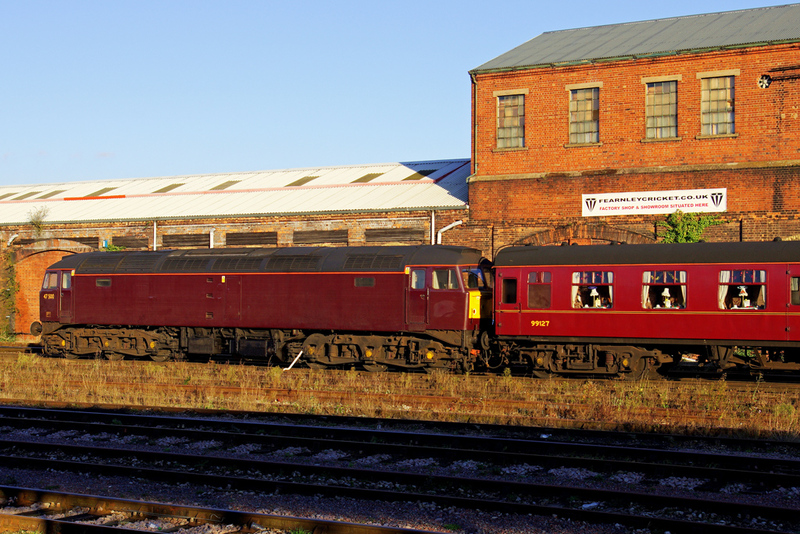 Pete Wilcox photographed the locomotives at Shrub Hill Station on Saturday 1st December 2012.